CenterFocus is proud to be the first company to offer guided backpacking tours and overnight guided camping trips in the Red Rocks of Sedona, Arizona. CenterFocus is a fully permitted and insured company locally based in the Sedona, Arizona area. Our reviews are un-beatable, and we are one of the highest ranked and leading adventure companies within the Sedona area. See for yourself here at www.tripadvisor.com! Our guided backpacking tours can take us into the Red Rocks of Sedona, to travel through pristine locations and spend our night outdoors with comfortable camping setups, providing us an amazing view of the starry skies. These trips are adaptable by nature for advanced hikers, or for a novice simply looking to spend a few days with the family in a beautiful setting while enjoying the peace and solitude of the Red Rocks within the Coconino National Forest. All trips are all inclusive, with no added fees, round trip transport, all meals and snacks, as well as all of your backpacking and camping equipment is included, so you need to only pack in accordance with our provided clothing list, and show up on time. After that you only need to enjoy the calm waters along our waterway creek based hikes, or the big views from our Walker Basin hike, providing a panorama of the Sedona beauty from above, gazing down into the spectacular Red Rocks as if coming in on an airplane. Our tours along the local creek systems such as West Clear Creek offer gorgeous crystal clear pools to swim in, located right near our camps and also along the entire duration of the hike. 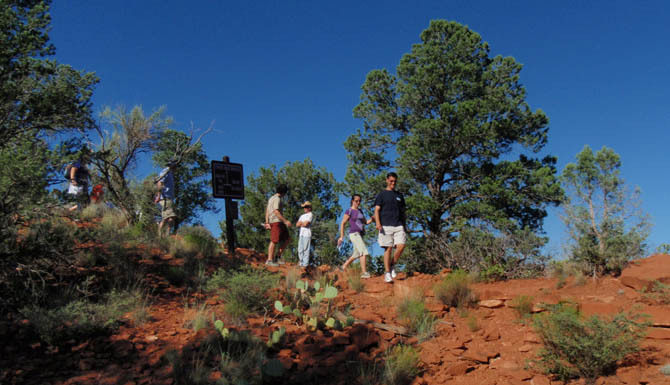 No matter what season it is, our guided backpacking tours in Sedona will provide your family with an experience that will last a lifetime, and these trips can be customized for most abilities, desires, and needs. Regardless if you are looking for a fun time outside with the family, or a romantic moment in solitude within a breathless and awe inspiring wilderness, CenterFocus can provide you with the ideal tour. - Trip includes guides, all hiking and camping equipment, round trip transportation from your Sedona hotel, comfortable sleeping setups, all meals, drinks, snacks, taxes and fees.